There was an effortless charm to Night At The Museum that made it more than passable family fare. 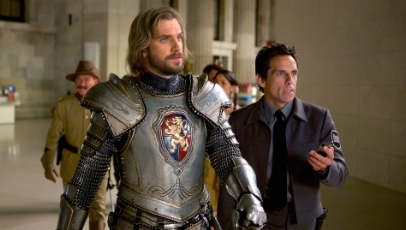 Two films later and the franchise is now passed its sell-by date and, as a result, Night At The Museum: Secret Of The Tomb is mostly predictable swill. When the tablet that brings the exhibits in New York City to life runs out of steam, Larry (Ben Stiller) has to venture over to London with some familiar faces in tow – Teddy Roosevelt (Robin Williams), Octavious (Steve Coogan) and Jedediah (Owen Wilson) – to set things right. Looped around a paper-thin narrative that makes little to no sense, Secret Of The Tomb muddles through on the back of its cast. Yet, even then, it’s only the newcomers – Dan Stevens as Sir Lancelot and Ben Kingsley as Merenkahre, the pharoah who created the tablet – who make the biggest impression. The screenwriters desperately try to make the audience care about the characters. But the simple truth is that these characters have never been more than faces, so the ham-fisted attempts at carving out moments of sentiment fall flat almost immediately. There are, of course, elements that work, such as two inspired set pieces (one of which is set within M.C. Escher’s famous lithograph) and the poignancy of Williams’ final screen performance. Sadly, none of its successes make up for Secret Of The Tomb’s many shortcomings.